6414 telegram Decorative sheet telegram with on face colorless embossing (hammer and sickle with ears of corn) with golden border, as well string in yellow / red / black, unused in excellent condition. Extraordinarily rare! 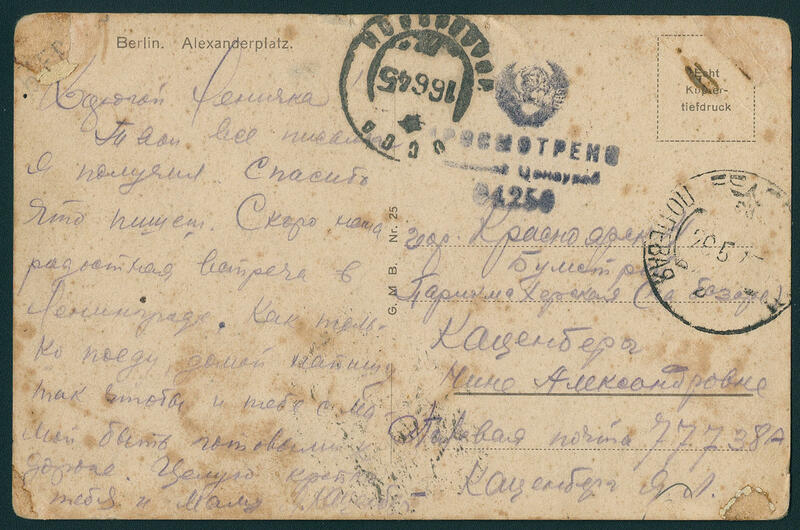 5963 ✉ Army postal service picture postcard \"Berlin-Alexanderplatz\" from a soldiers the red army with the fieldpost number 77738 A to Krasnodor from 28. 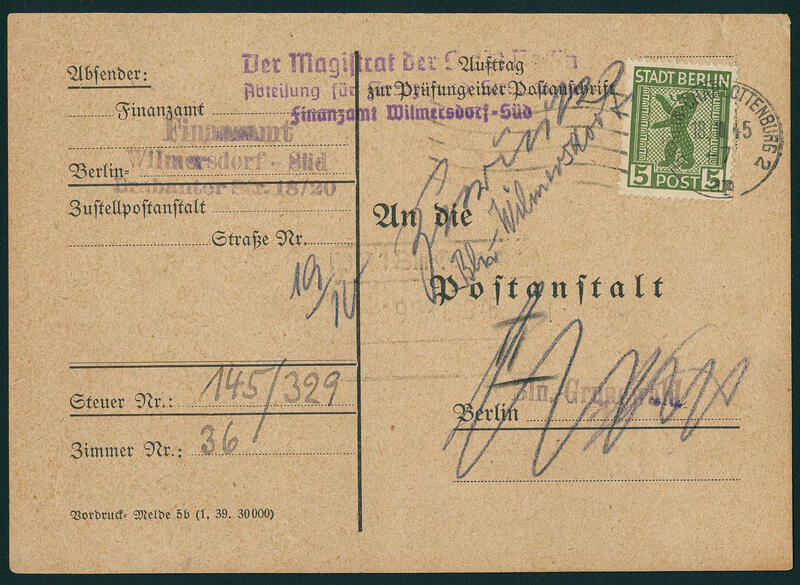 May 1945, alongside Russian censorship stamp and arrival postmark from Krasnodor. A contemporary document. 5964 ✉ 1AAvx 5 Pfg. 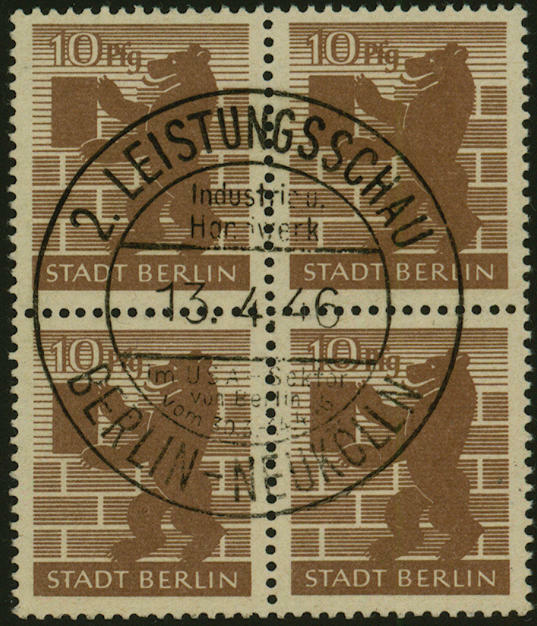 Blackish yellow green, Berlin bear-edition, correctly franked single franking on \"request to the examination one mailing address\" from \"BERLIN-CHARLOTTENBURG 18.10.45. \" in the local usage transported with different note. An extraordinarily scarce utilization. 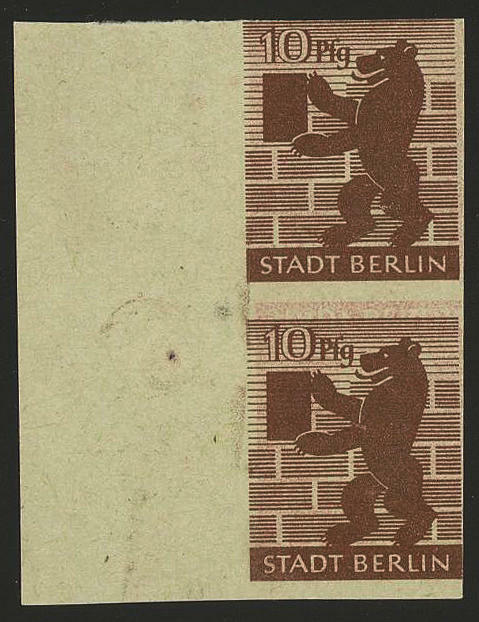 There are only few documents of this kind from Berlin have become known. Photo expertize \"genuine and immaculate\" Ströh BPP. 5965 2Abwbz 6 Pfg. 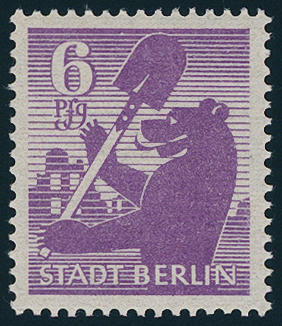 Medium blue-violet-coloured, the scarce colour on smooth, pale chrome-yellow sounded paper with horizontal ribbed gum embossing, fresh colors and very well perforated, in perfect condition mint never hinged, photo expertize \"genuine and immaculate\" Ströh BPP. 5966 3AvxU 8 Pfg. 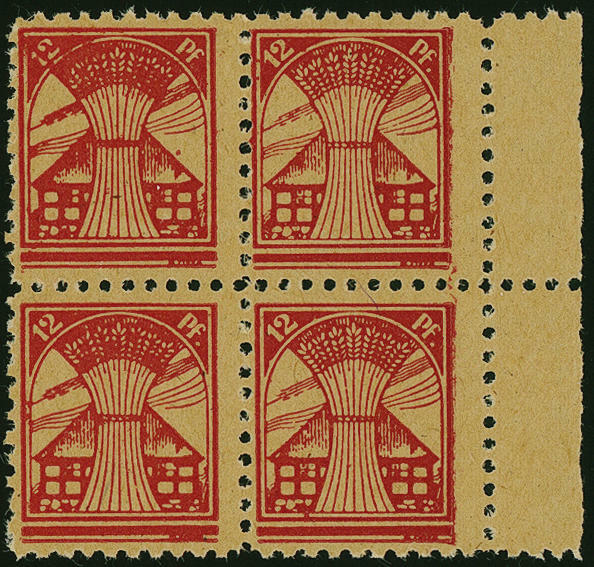 Orange red, unperforated, horizontal pair from upper margin with figure of value of rows, in perfect condition mint never hinged in perfect condition. A scarce variety! Photo expertize \"genuine and immaculate\" Ströh BPP. 5967 ⊙ 4Abwb 10 Pfg. 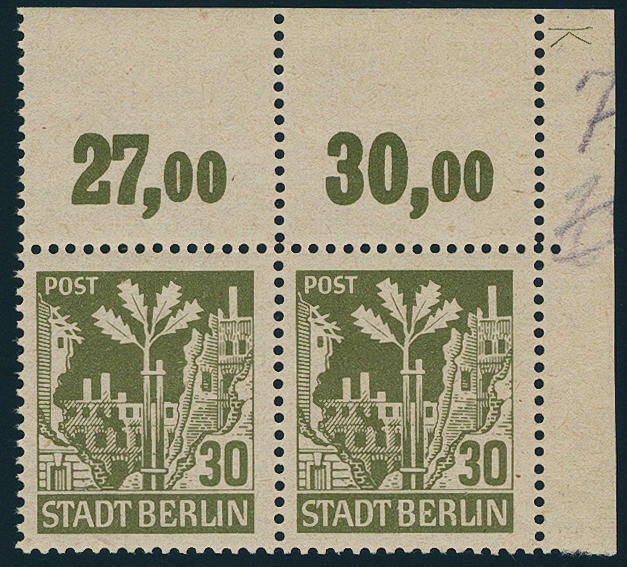 Sienna light on bright chrome sounded paper with horizontal ribbed gum embossing, block of four wonderful fresh colors with perfect centered, pricked clear special cancellation \"BERLIN-NEUKÖLLN 13.4.46\" in utterly perfect condition. Already single a SBZ-rarity, in this kind as block of four a definitely piece of dream for your highest requirements! Photo expertize \"genuine and immaculate\" Ströh BPP. 5968 4P/5P 10 Pfg. Medium sienna and 12 Pfg. 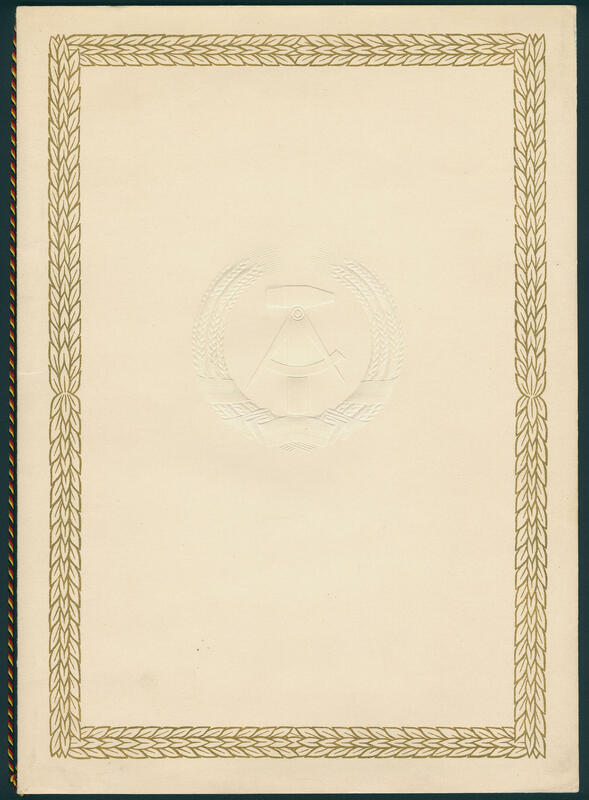 Red, on both sides imprinted proof in the vertical pair from margin of sheet on greenish white, ungummed cardboard paper unwatermarked. Additional wise the prints the 12 Pfg. A clearly visible inverted double impression on. In this kind in the Michel special catalogue unlisted and possibly unique! 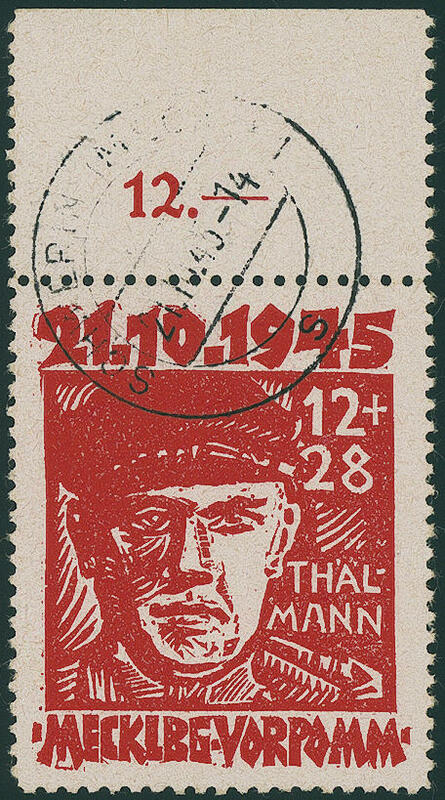 The here offered copy comes from the Ströh collection and obtained on of our 75. Auction a surtax from 3000,- €plus percentage of bid price. Photo expertize \"genuine and immaculate\" Ströh BPP. 5969 5AAuy 12 Pfg. Red in the horizontal, gef. 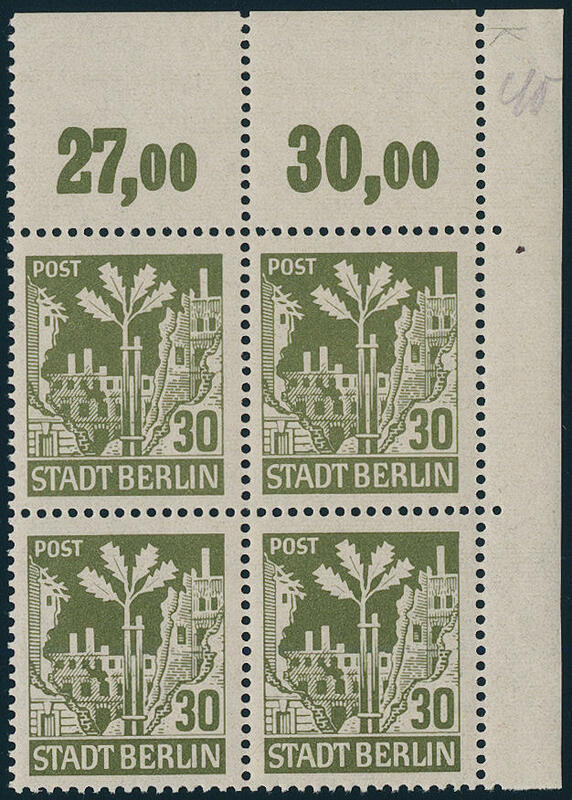 Strip of four, as well the left stamps field unprinted and the subsequent stamp almost to fifty-fifty with missing print, in perfect condition mint never hinged a scarce variety the through a glued paper web emerged. 5970 7AawazDZ 30 Pfg. Brownish olive on gray rose sounded paper with ribbed gum, horizontal corner margin pair top right with printer sign \"K\", unfolded, in perfect condition mint never hinged, very rare, photo expertize \"genuine and immaculate\" Dr. Jasch BPP. 5971 7AawbzDZ 30 Pfg. Brownish olive on pale chrome-yellow sounded paper with ribbed gum, corner margin block of four top right with printer sign \"K\", unfolded, in perfect condition mint never hinged, very rare, photo expertize \"genuine and immaculate\" Dr. Jasch BPP. 5972 FDC 8y,20/22 6 Pfg. 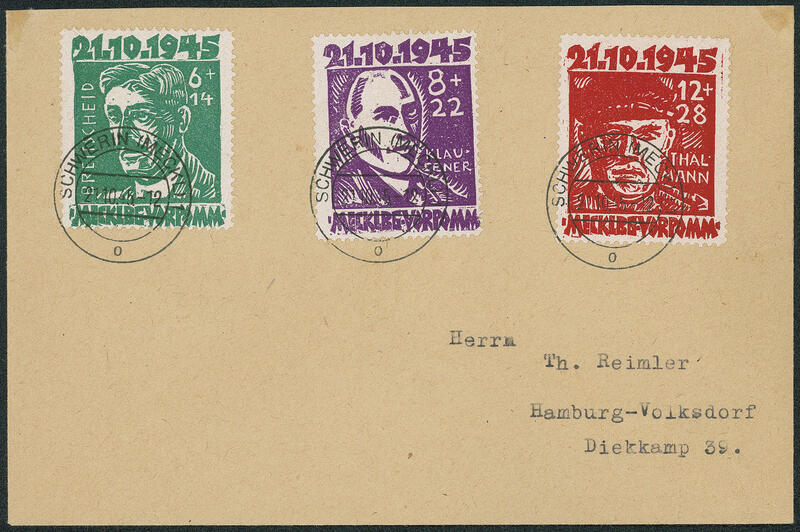 Celadon, the good colour in the block of three, along with the anti-fascist set on unlabelled cover with first day cancel for the anti-fascist issue \"SCHWERIN 21.10.45. \". Photo expertize \"genuine and immaculate\" Thom BPP. Michel 1070,- €. 5973 10xUMw 6 Pfg. 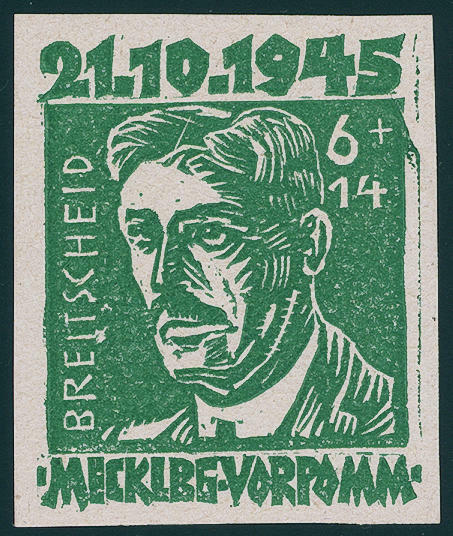 On pale buish green, vertical pair, in the middle unperforated, in the vertical strip of three from upper margin, in perfect condition mint never hinged Michel without valuation. 5974 14yG 8 Pfg. Black on light bluish gray green with extremely rare variety \"printed on the gummed side\", fresh colors and very well perforated, in perfect condition mint never hinged these variety belongs to the large rarities of this area and is in the Michel special catalogue due to missing offers only noted without price! Photo expertize \"the quality is perfect\" Kramp BPP. 5975 18IIdG 12 Pfg. 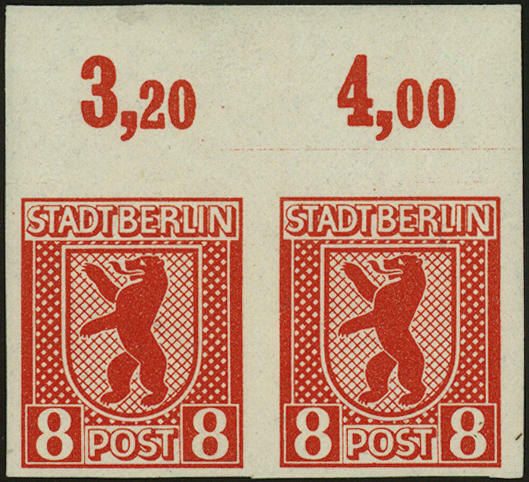 Brownish red, plate II, block of four from margin of sheet with printed on the gummed side, fresh colors and in perfect condition mint never hinged on field 40 is the plate flaw XVIII. An extraordinarily scarce variety, in this kind as block of four with the plate flaw unique! Photo expertize Kramp BPP. 5976 ⊙ 20aVII/22a Anti-fascist set 1945 uniform from upper margin, as well 6 Pfg. 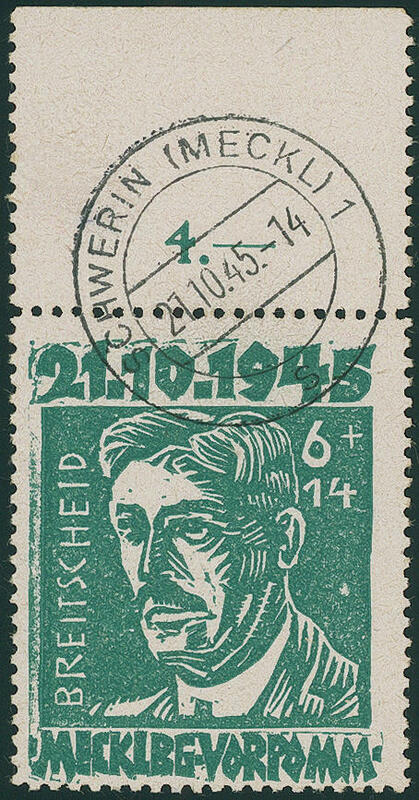 With plate flaw VII, perfect used \"SCHWERIN 27.10.45. \", expertized Kramp BPP. Michel 410,- €. 5977 FDC 20b 6 Pfg. Blackish yellow emerald-green, the scarce colour, fresh colors and very well perforated, in perfect condition with both others values of the set, cheap 12 Pfg. Empty spaces with ornaments, between stamps. 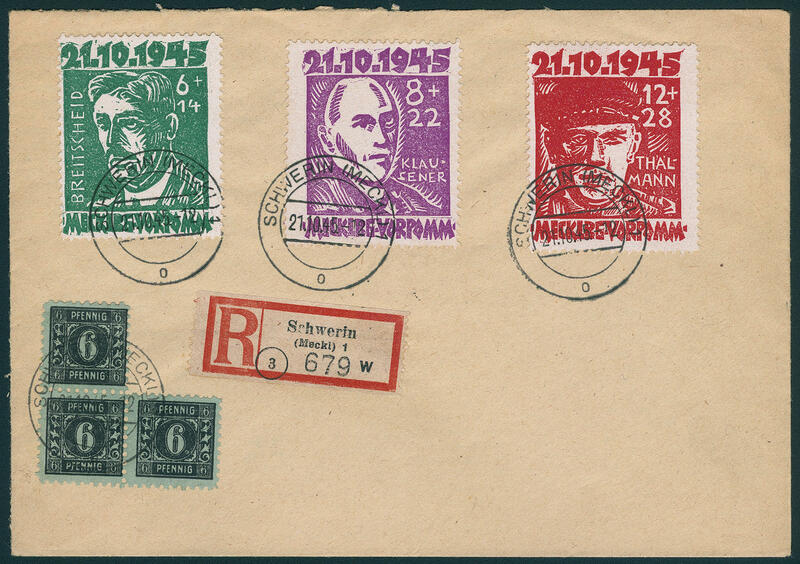 On philatelic First Day Cover from \"SCHWERIN 21.10.45. \". 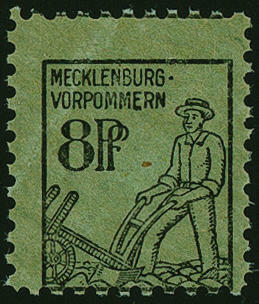 The scarce 6 Pfg. Is on First Day Cover also in the Michel special catalogue unlisted. A rarity of this area! Photo expertize Kramp BPP. 5978 20bUIV 6 Pfg. Blackish yellow emerald-green, four sides unperforated with plate flaw IV, in perfect condition mint never hinged a very scarce variety and associated with the plate flaw a Soviet Zone rarity! Photo expertize \"genuine and immaculate\" Kramp BPP. Michel 1630,- €. 5979 20bUMw 6 Pfg. Blackish yellow emerald-green, vertical pair from upper margin, above and centered unperforated, fresh colors and in perfect condition mint never hinged an extremely rare variety as attractive unit. By Michel only noted without price. Expertized. Kramp BPP. 5980 20bUu 6 Pfg. Yellowish emerald green from lower margin, at the bottom unperforated, in perfect condition mint never hinged a spectacular variety, like they also in the Michel special catalogue up to now unlisted is! Photo expertize \"genuine and immaculate\" Kramp BPP. 5981 ⊙ 20bVII 6 Pfg. 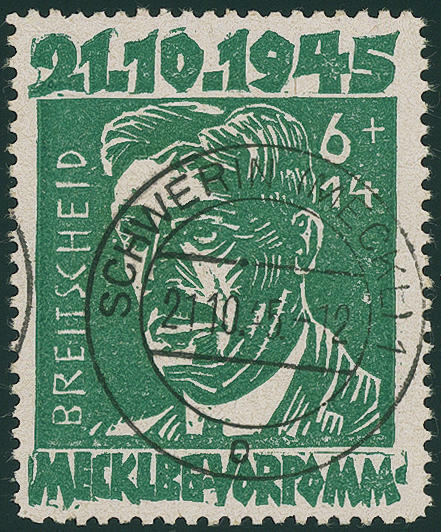 Blackish yellow emerald-green, the scarce colour with plate flaw VII, fresh colors and very well perforated, very nice canceled \"SCHWERIN 21.10.45. \". Photo expertize \"genuine and immaculate\" Kramp BPP.